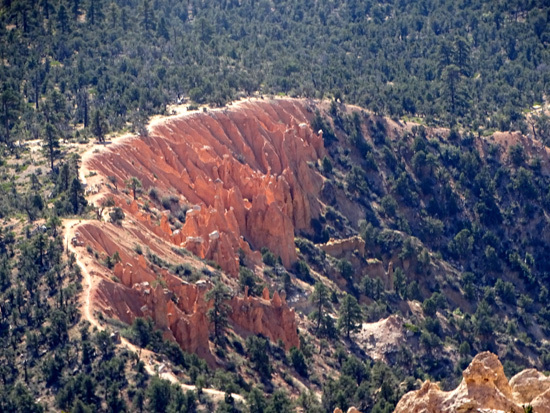 "Descend the Under-the-Rim Trail to see a cluster of balanced-rock hoodoos." 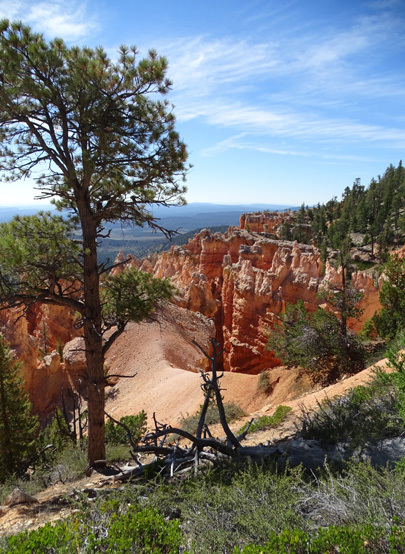 This is one of three trailheads from the Bryce Point parking area at the southern end of the main Bryce Canyon amphitheater. 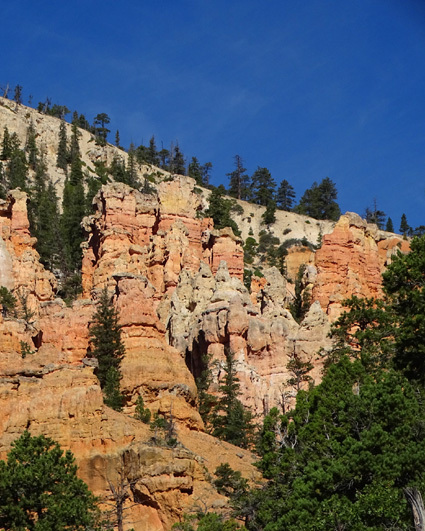 Bryce Point is the last stop on the shuttle bus route. 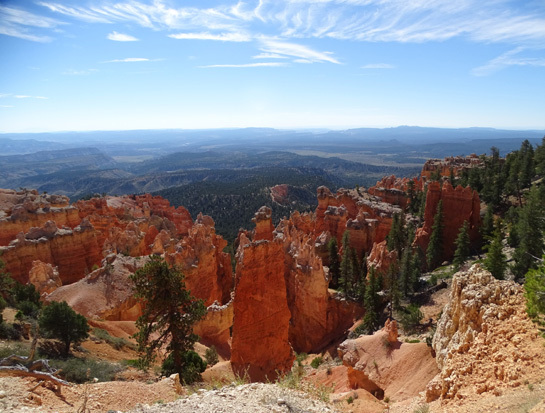 In this entry I'll show photos along the Under-the-Rim Trail from Bryce Point down to the Hat Shop formation and a little beyond, a one-way distance of 2.7 miles per my GPS on the day I hiked this route. It's a bit shorter if you turn around right at the end of the "hats." 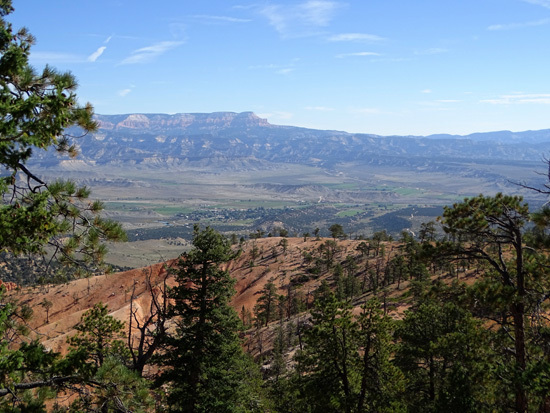 The trail is rated as "moderate" in the park newspaper and "moderately difficult" on the park website because of the high altitudes in the park and the elevation gain and loss on this hike. Many park visitors aren't used to that. 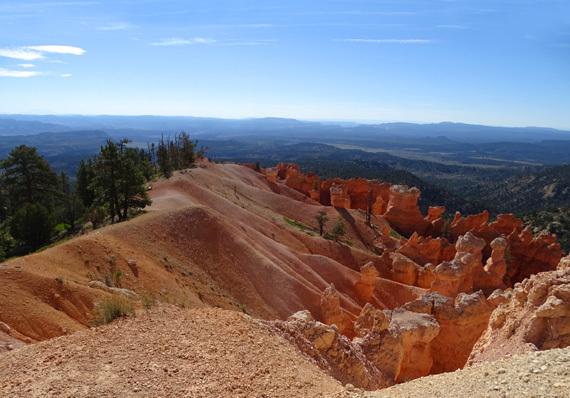 The trail starts high at the Bryce Point parking area (8,300 feet) and drops over 2.7 miles to 7,350 feet where I turned around a little past the hat formations (and before a long drop down even farther). 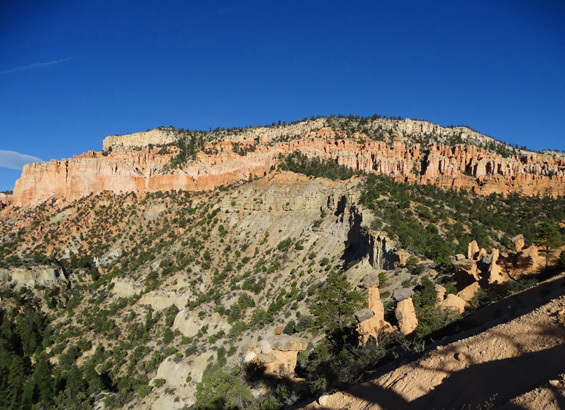 Then you have to hike back up a 950-foot elevation gain. 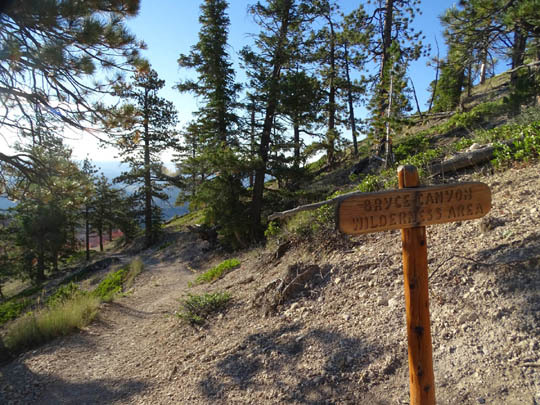 Because the trail undulates a bit, my total elevation gain and loss was 2,400 feet over 5.42 miles out and back. 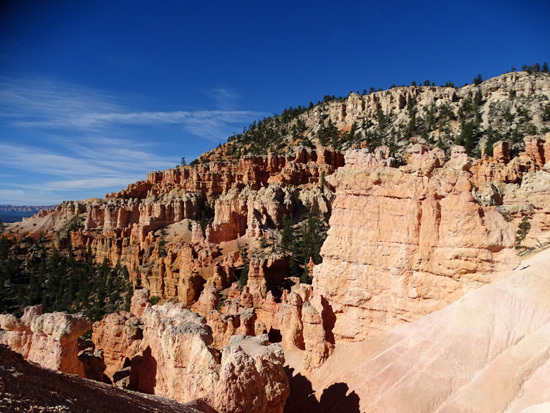 There are enough switchbacks that the descent and ascent are gradual. There are no steep sections. 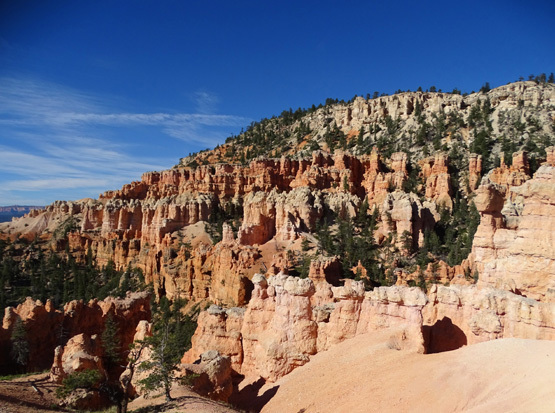 Since I'm acclimated to the high altitude, mountainous terrain, high-desert sun, and hiking farther than this, I thought the hike was moderately easy. It just depends on how well trained you are for park conditions. 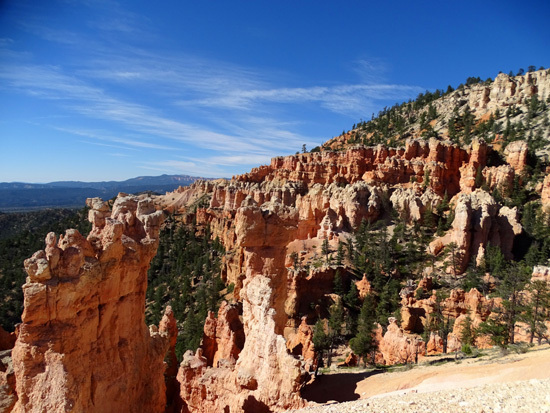 Visitors begin this hike down the steps from the parking area like they do for the Bryce Point Trail to Peekaboo. 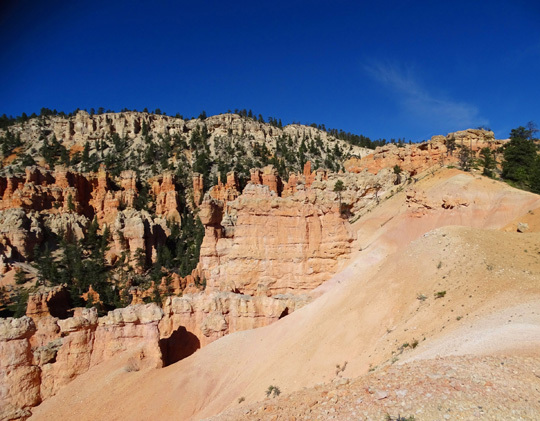 After a few hundred feet the Bryce Point Trail turns left and there is a sign pointing straight ahead toward Hat Shop. 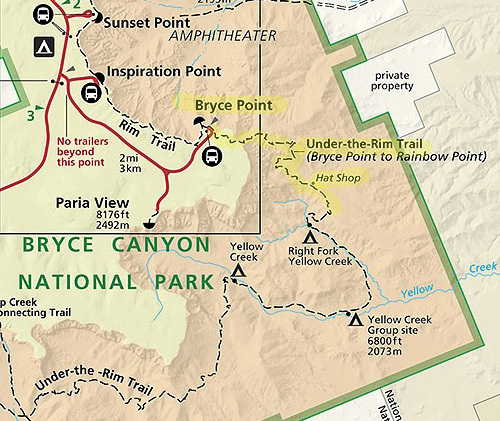 Before long there is a sign notifying hikers that they are entering the Bryce Canyon Wilderness. 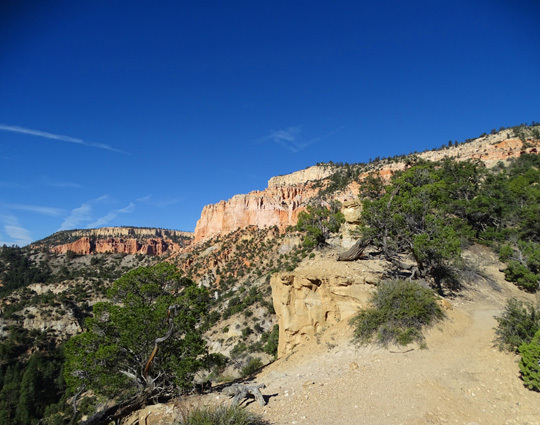 The rest of the Under-the-Rim Trail -- all 23 miles or more of it -- is in the wilderness area. 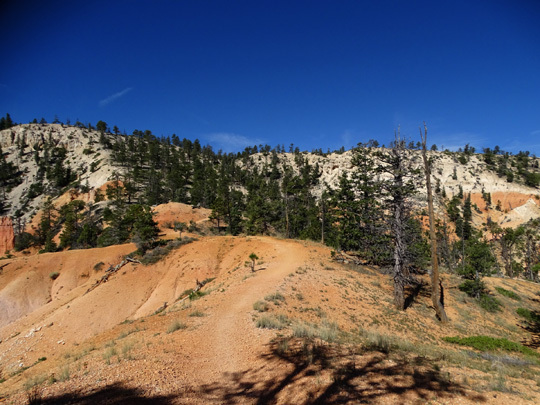 Fairyland, Under-the-Rim, Sheep Creek, Swamp Canyon, Bristlecone, and Riggs Spring Trails are all in the wilderness area. 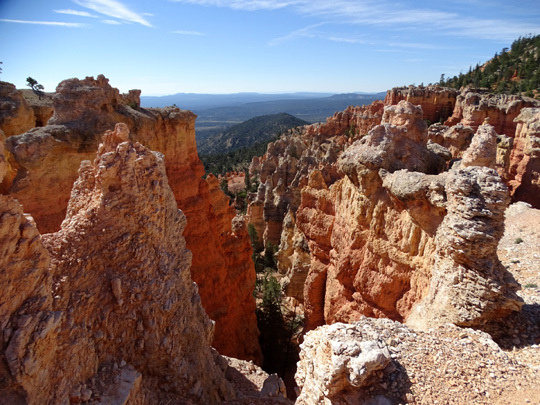 Although they are still in Bryce Canyon National Park they are more narrow and rough than trails in the uber-popular main amphitheater area. 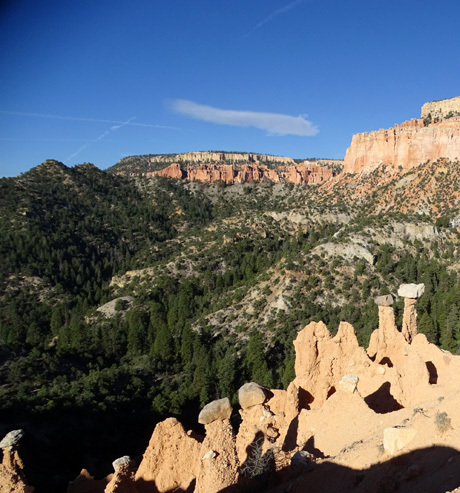 The wilderness trails all have up-close and distant views of interesting rock formation but the formations aren't as spectacular as the trails in the huge main amphitheater. 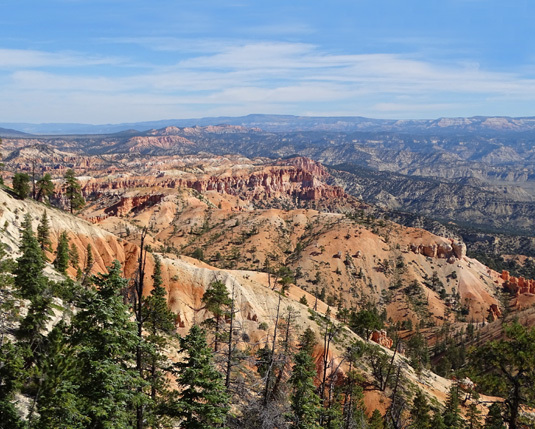 In addition, most of the wilderness trails are not served by the shuttle bus system and tour buses don't have room to park at their small trailheads -- except Bryce Point. 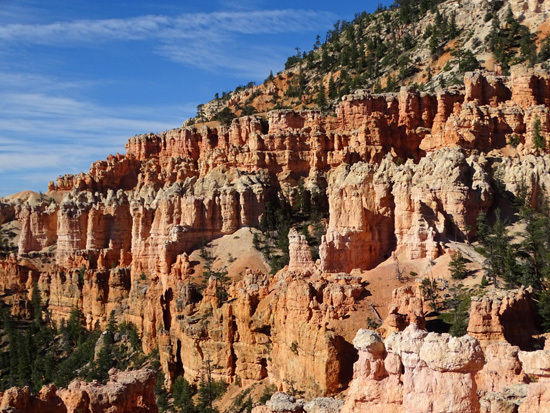 And all these factors mean that many fewer people hike these trails! It was nice to be able to take lots of pictures and not have to wait until other hikers moved on. 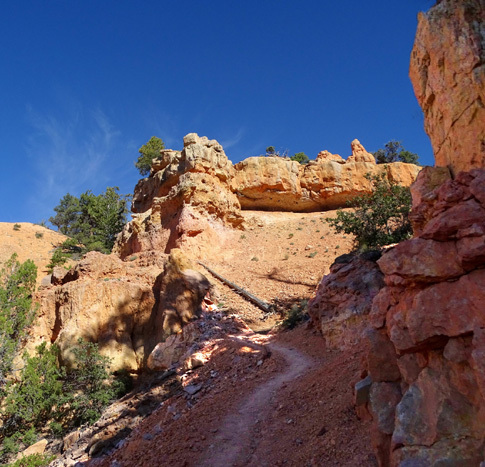 If you want to avoid crowded trails like Queen's Garden and the Navajo-Wall Street Loop, head for one of the wilderness trails. 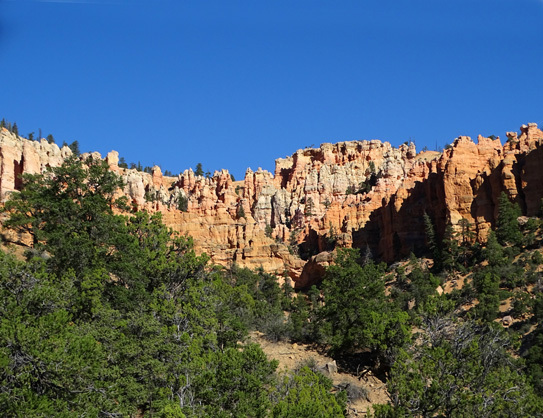 The beautiful sunny morning I hiked to Hat Shop I saw a grand total of four other hikers in 5� miles -- and they were all backpackers who were spending one or more nights on the trail. 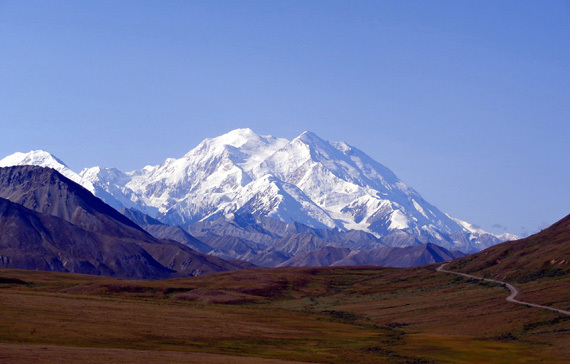 You can camp in the backcountry with a $5 permit, but you don't need a permit to day-hike there. OK, SUE, WHAT IS THE "HAT SHOP?" 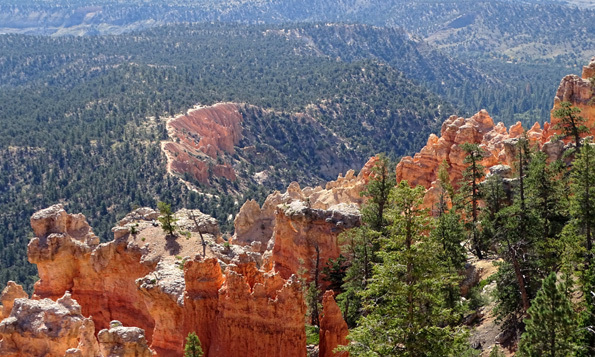 The trail is on the rim right above the hat formations. If you use your imagination they do kind of resemble the forms that millinery and department stores used to use (maybe some still do?) to display their hats for sale. 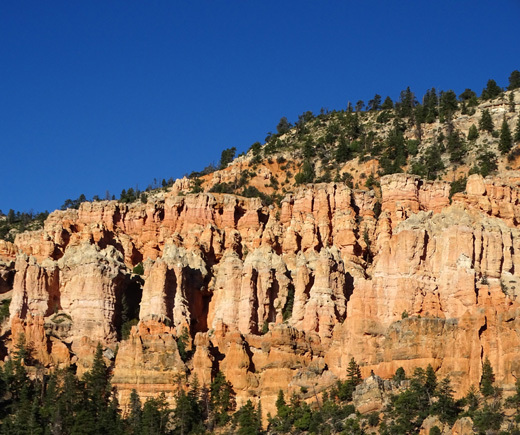 On the way back to the rim I realized after seeing the hat formations at close range that they are visible from much higher up on the trail. 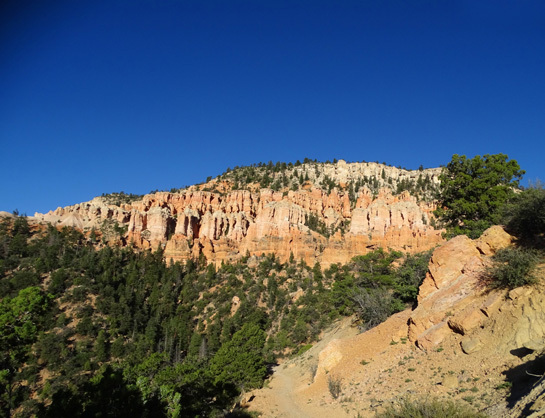 I didn't know that on the way down because they are hard to see if you haven't hiked the trail before and don't know exactly what you're looking for. 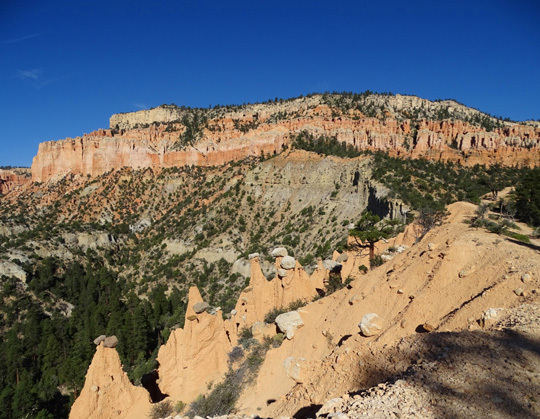 The hat formations are just below and right of the arcing trail in the center of this photo. 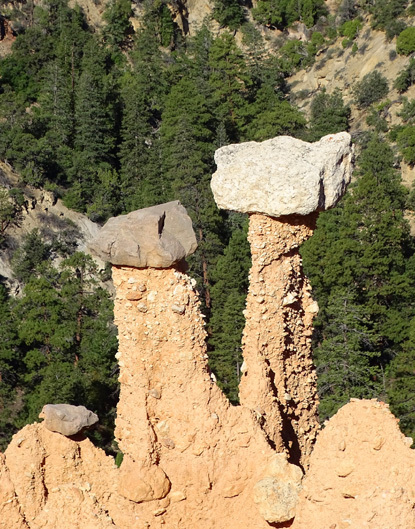 The hat formations are similar to "mushroom" formations we've seen elsewhere. 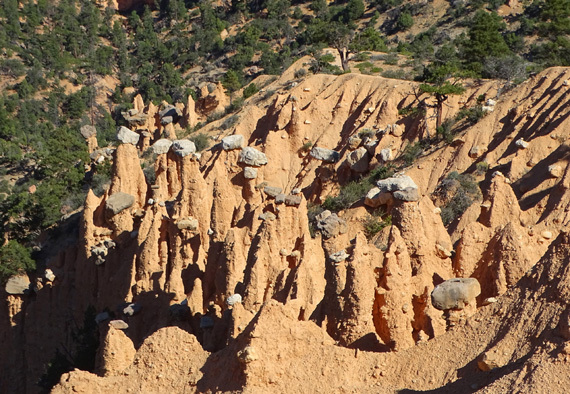 They are in a later stage of erosion than the connected pillars we see in many of the rock formations in the various canyons at Bryce and other places in southern Utah. 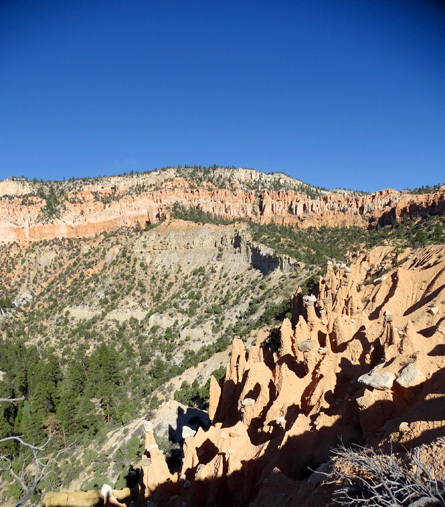 The remaining photos show other scenes that are roughly in order from Bryce Point down to the Hat Shop formations. 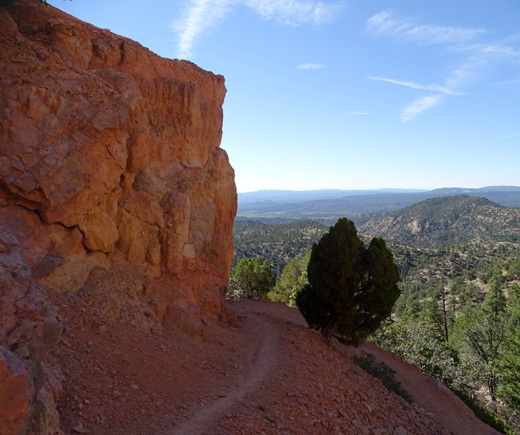 Some trail views look ahead (down), some behind (back up). 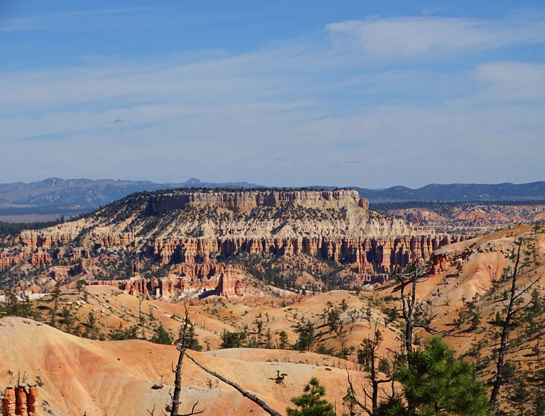 which is in Grand Staircase-Escalante National Monument. 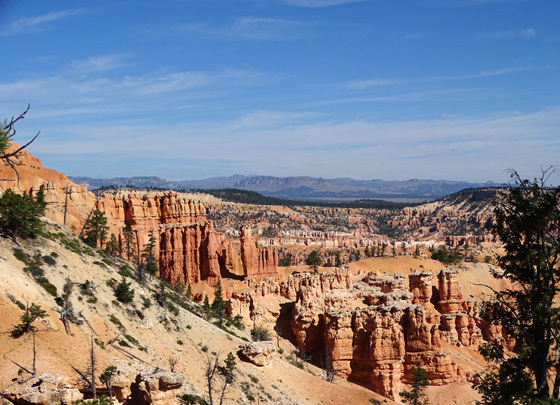 The trail continues south from there through the Bryce Canyon Wilderness to Rainbow Point, a distance of about 19 miles. 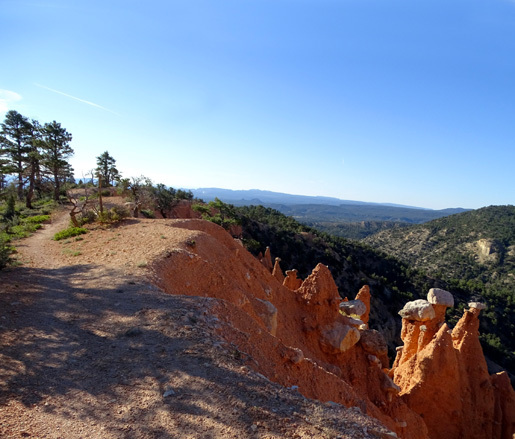 The Under-the-Rim Trail to Hat Shop has views of some beautiful formations, most of them literally right under the rim, and the "hats" are fun when you see them the first time. Other parts of the trail that I haven't shown here are much less remarkable. 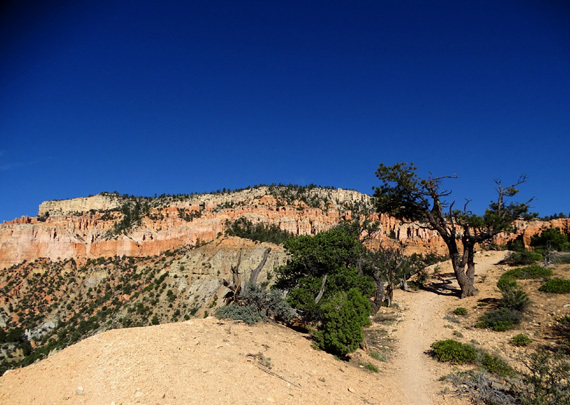 This is a good trail to hike if you like solitude and have several days to spend in the park. 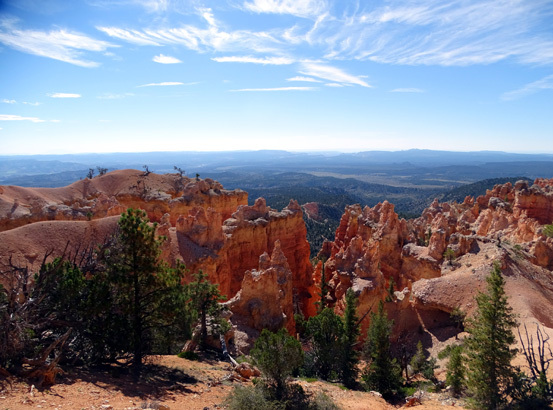 If your time is really limited, however, I'd recommend that you hike the spectacular Fairyland loop and/or the more crowded, formation-rich trails in the large Bryce Amphitheater first. 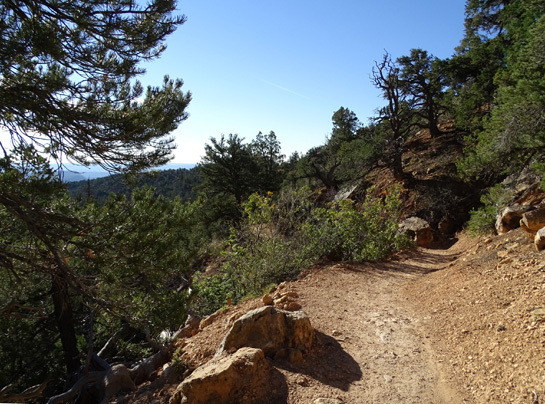 There are good reasons why those trails are popular.